Download "Lominger Standard 67 Competencies and Related Descriptions"
1 Lominger Standard 67 Competencies and Related Descriptions 1) Action Oriented Enjoys working hard; is action oriented and full of energy for the things he/she sees as challenging; not fearful of acting with a minimum of planning; seizes more opportunities than others. 2) Dealing With Ambiguity Can effectively cope with change; can shift gears comfortably; can decide and act without having the total picture; isn t upset when things are up in the air; doesn t have to finish things before moving on; can comfortably handle risk and uncertainty. 3) Approachability Is easy to approach and talk to; spends the extra effort to put others at ease; can be warm, pleasant, and gracious; is sensitive to and patient with the interpersonal anxieties of others; builds rapport well; is a good listener; is an early knower, getting informal and incomplete information in time to do something about it. 4) Boss Relationships Responds and relates well to bosses; would work harder for a good boss; is open to learning from bosses who are good coaches and who provide latitude; likes to learn from those who have been there before; easy to challenge and develop; is comfortably coachable. 5) Business Acumen Knows how businesses work; knowledgeable in current and possible future policies, practices, trends, and information affecting his/her business and organization; knows the competition; is aware of how strategies and tactics work in the marketplace. 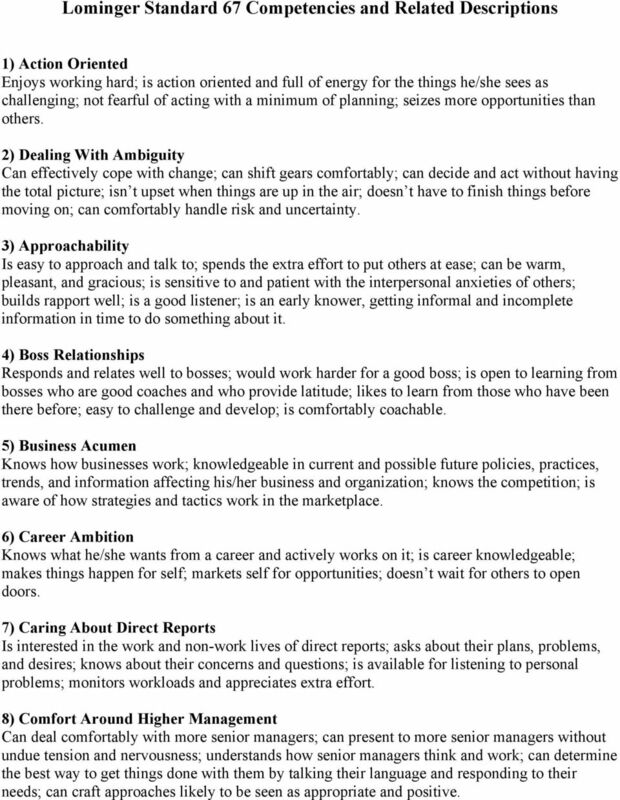 6) Career Ambition Knows what he/she wants from a career and actively works on it; is career knowledgeable; makes things happen for self; markets self for opportunities; doesn t wait for others to open doors. 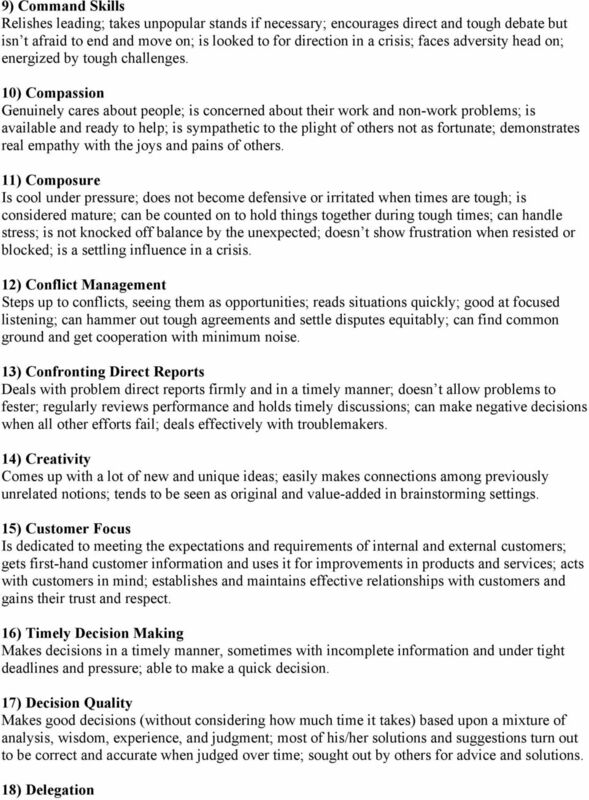 7) Caring About Direct Reports Is interested in the work and non-work lives of direct reports; asks about their plans, problems, and desires; knows about their concerns and questions; is available for listening to personal problems; monitors workloads and appreciates extra effort. 8) Comfort Around Higher Management Can deal comfortably with more senior managers; can present to more senior managers without undue tension and nervousness; understands how senior managers think and work; can determine the best way to get things done with them by talking their language and responding to their needs; can craft approaches likely to be seen as appropriate and positive. 3 Clearly and comfortably delegates both routine and important tasks and decisions; broadly shares both responsibility and accountability; tends to trust people to perform; lets direct reports finish their own work. 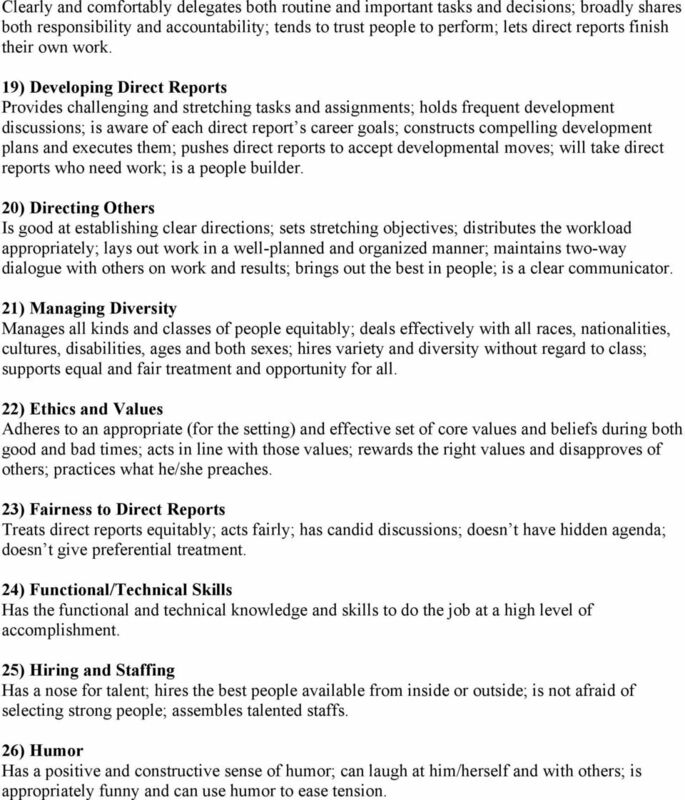 19) Developing Direct Reports Provides challenging and stretching tasks and assignments; holds frequent development discussions; is aware of each direct report s career goals; constructs compelling development plans and executes them; pushes direct reports to accept developmental moves; will take direct reports who need work; is a people builder. 20) Directing Others Is good at establishing clear directions; sets stretching objectives; distributes the workload appropriately; lays out work in a well-planned and organized manner; maintains two-way dialogue with others on work and results; brings out the best in people; is a clear communicator. 21) Managing Diversity Manages all kinds and classes of people equitably; deals effectively with all races, nationalities, cultures, disabilities, ages and both sexes; hires variety and diversity without regard to class; supports equal and fair treatment and opportunity for all. 22) Ethics and Values Adheres to an appropriate (for the setting) and effective set of core values and beliefs during both good and bad times; acts in line with those values; rewards the right values and disapproves of others; practices what he/she preaches. 23) Fairness to Direct Reports Treats direct reports equitably; acts fairly; has candid discussions; doesn t have hidden agenda; doesn t give preferential treatment. 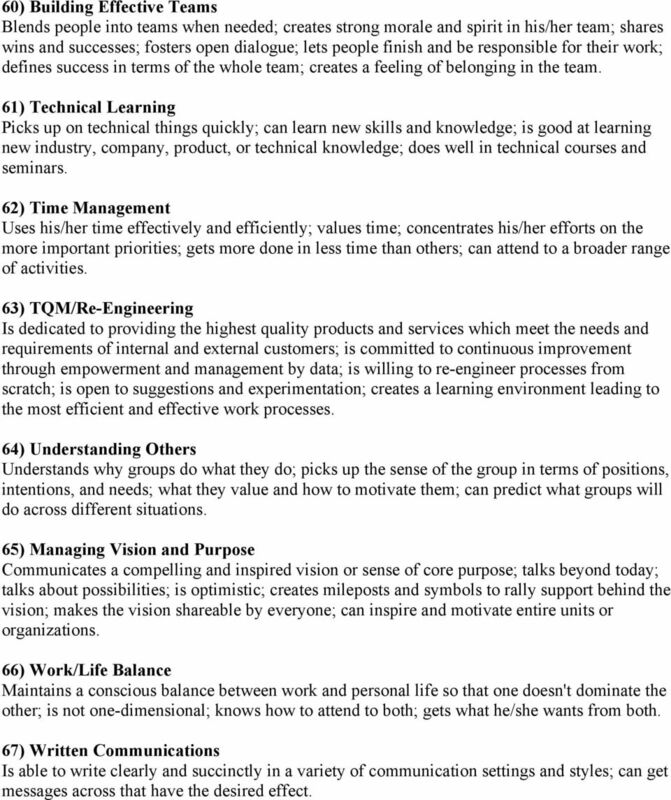 24) Functional/Technical Skills Has the functional and technical knowledge and skills to do the job at a high level of accomplishment. 25) Hiring and Staffing Has a nose for talent; hires the best people available from inside or outside; is not afraid of selecting strong people; assembles talented staffs. 26) Humor Has a positive and constructive sense of humor; can laugh at him/herself and with others; is appropriately funny and can use humor to ease tension. 4 27) Informing Provides the information people need to know to do their jobs and to feel good about being a member of the team, unit, and/or the organization; provides individuals information so that they can make accurate decisions; is timely with information. 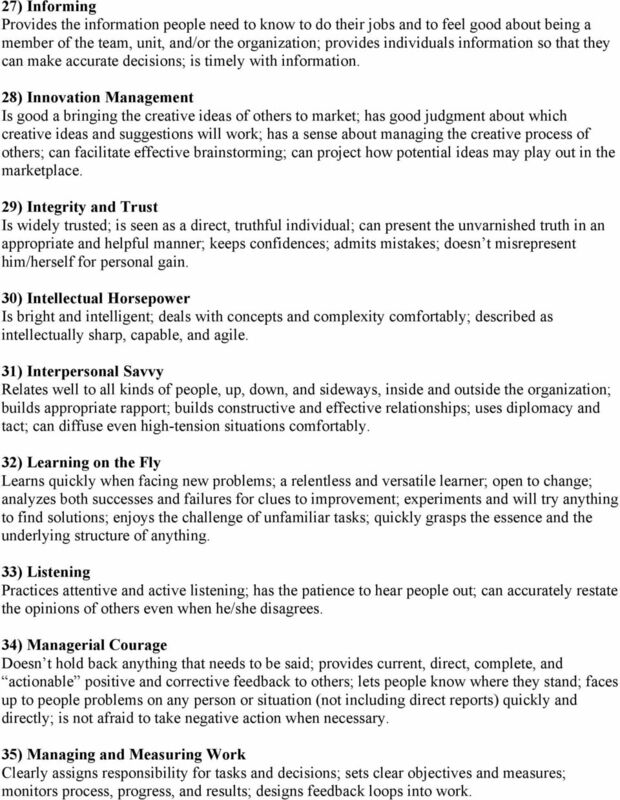 28) Innovation Management Is good a bringing the creative ideas of others to market; has good judgment about which creative ideas and suggestions will work; has a sense about managing the creative process of others; can facilitate effective brainstorming; can project how potential ideas may play out in the marketplace. 29) Integrity and Trust Is widely trusted; is seen as a direct, truthful individual; can present the unvarnished truth in an appropriate and helpful manner; keeps confidences; admits mistakes; doesn t misrepresent him/herself for personal gain. 30) Intellectual Horsepower Is bright and intelligent; deals with concepts and complexity comfortably; described as intellectually sharp, capable, and agile. 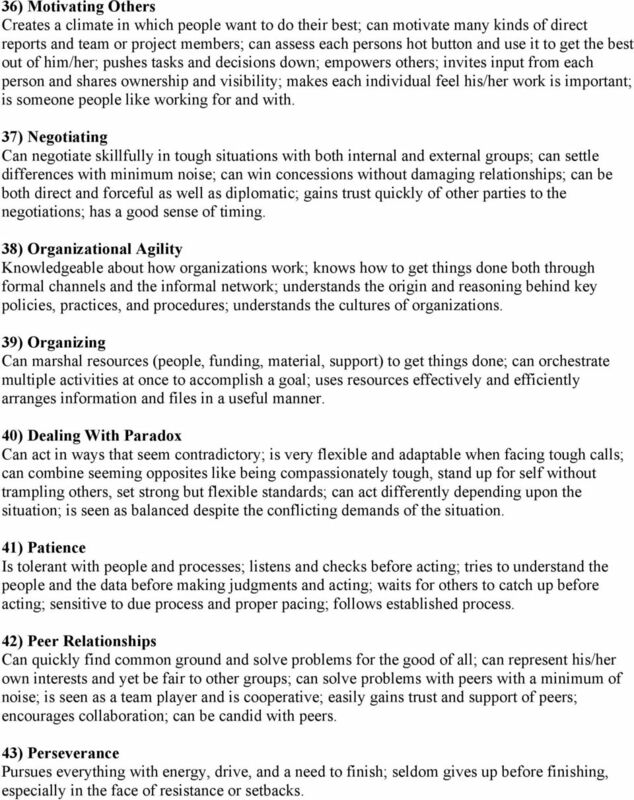 31) Interpersonal Savvy Relates well to all kinds of people, up, down, and sideways, inside and outside the organization; builds appropriate rapport; builds constructive and effective relationships; uses diplomacy and tact; can diffuse even high-tension situations comfortably. 32) Learning on the Fly Learns quickly when facing new problems; a relentless and versatile learner; open to change; analyzes both successes and failures for clues to improvement; experiments and will try anything to find solutions; enjoys the challenge of unfamiliar tasks; quickly grasps the essence and the underlying structure of anything. 33) Listening Practices attentive and active listening; has the patience to hear people out; can accurately restate the opinions of others even when he/she disagrees. 34) Managerial Courage Doesn t hold back anything that needs to be said; provides current, direct, complete, and actionable positive and corrective feedback to others; lets people know where they stand; faces up to people problems on any person or situation (not including direct reports) quickly and directly; is not afraid to take negative action when necessary. 35) Managing and Measuring Work Clearly assigns responsibility for tasks and decisions; sets clear objectives and measures; monitors process, progress, and results; designs feedback loops into work. 5 36) Motivating Others Creates a climate in which people want to do their best; can motivate many kinds of direct reports and team or project members; can assess each persons hot button and use it to get the best out of him/her; pushes tasks and decisions down; empowers others; invites input from each person and shares ownership and visibility; makes each individual feel his/her work is important; is someone people like working for and with. 37) Negotiating Can negotiate skillfully in tough situations with both internal and external groups; can settle differences with minimum noise; can win concessions without damaging relationships; can be both direct and forceful as well as diplomatic; gains trust quickly of other parties to the negotiations; has a good sense of timing. 38) Organizational Agility Knowledgeable about how organizations work; knows how to get things done both through formal channels and the informal network; understands the origin and reasoning behind key policies, practices, and procedures; understands the cultures of organizations. 39) Organizing Can marshal resources (people, funding, material, support) to get things done; can orchestrate multiple activities at once to accomplish a goal; uses resources effectively and efficiently arranges information and files in a useful manner. 40) Dealing With Paradox Can act in ways that seem contradictory; is very flexible and adaptable when facing tough calls; can combine seeming opposites like being compassionately tough, stand up for self without trampling others, set strong but flexible standards; can act differently depending upon the situation; is seen as balanced despite the conflicting demands of the situation. 41) Patience Is tolerant with people and processes; listens and checks before acting; tries to understand the people and the data before making judgments and acting; waits for others to catch up before acting; sensitive to due process and proper pacing; follows established process. 42) Peer Relationships Can quickly find common ground and solve problems for the good of all; can represent his/her own interests and yet be fair to other groups; can solve problems with peers with a minimum of noise; is seen as a team player and is cooperative; easily gains trust and support of peers; encourages collaboration; can be candid with peers. 43) Perseverance Pursues everything with energy, drive, and a need to finish; seldom gives up before finishing, especially in the face of resistance or setbacks. 6 44) Personal Disclosure Shares his/her thoughts about personal strengths, weaknesses, and limitations; admits mistakes and shortcomings; is open about personal beliefs and feelings; is easy to get to know for those who interact with him/her regularly. 45) Personal Learning Picks up on the need to change personal, interpersonal, and managerial behavior quickly; watches others for their reactions to his/her attempts to influence and perform, and adjusts; seeks feedback; is sensitive to changing personal demands and requirements and changes accordingly. 46) Perspective Looks toward the broadest possible view of an issue/challenge; has broad-ranging personal and business interests and pursuits; can easily pose future scenarios; can think globally; can discuss multiple aspects and impacts of issues and project them into the future. 47) Planning Accurately scopes out length and difficulty of tasks and projects; sets objectives and goals; breaks down work into the process steps; develops schedules and task/people assignments; anticipates and adjusts for problems and roadblocks; measures performance against goals; evaluates results. 48) Political Savvy Can maneuver through complex political situations effectively and quietly; is sensitive to how people and organizations function; anticipates where the land mines are and plans his/her approach accordingly; views corporate politics as a necessary part of organizational life and works to adjust to that reality; is a maze-bright person. 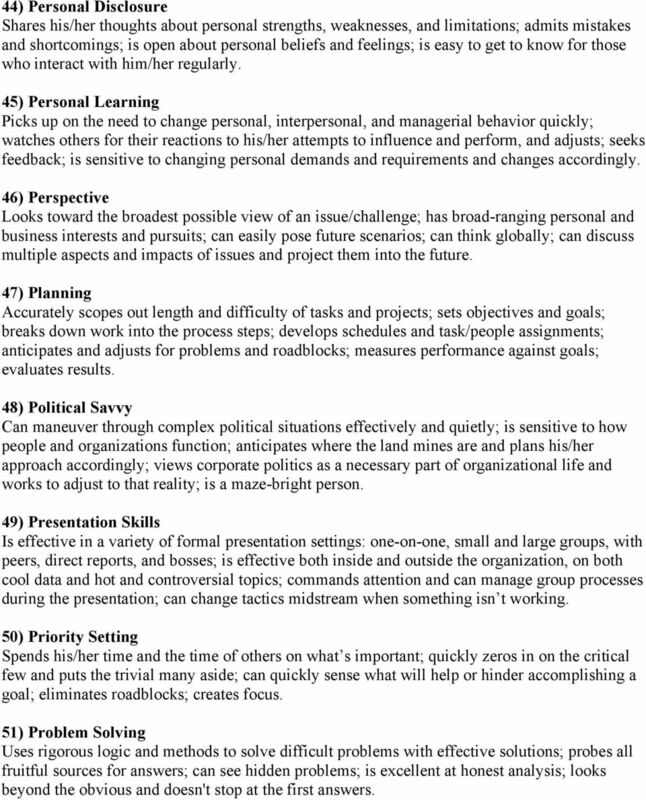 49) Presentation Skills Is effective in a variety of formal presentation settings: one-on-one, small and large groups, with peers, direct reports, and bosses; is effective both inside and outside the organization, on both cool data and hot and controversial topics; commands attention and can manage group processes during the presentation; can change tactics midstream when something isn t working. 50) Priority Setting Spends his/her time and the time of others on what s important; quickly zeros in on the critical few and puts the trivial many aside; can quickly sense what will help or hinder accomplishing a goal; eliminates roadblocks; creates focus. 51) Problem Solving Uses rigorous logic and methods to solve difficult problems with effective solutions; probes all fruitful sources for answers; can see hidden problems; is excellent at honest analysis; looks beyond the obvious and doesn't stop at the first answers. 7 52) Process Management Good at figuring out the processes necessary to get things done; knows how to organize people and activities; understands how to separate and combine tasks into efficient work flow; knows what to measure and how to measure it; can see opportunities for synergy and integration where others can't; can simplify complex processes; gets more out of fewer resources. 53) Drive For Results Can be counted on to exceed goals successfully; is constantly and consistently one of the top performers; very bottom-line oriented; steadfastly pushes self and others for results. 54) Self-Development Is personally committed to and actively works to continuously improve him/herself; understands that different situations and levels may call for different skills and approaches; works to deploy strengths; works on compensating for weakness and limits. 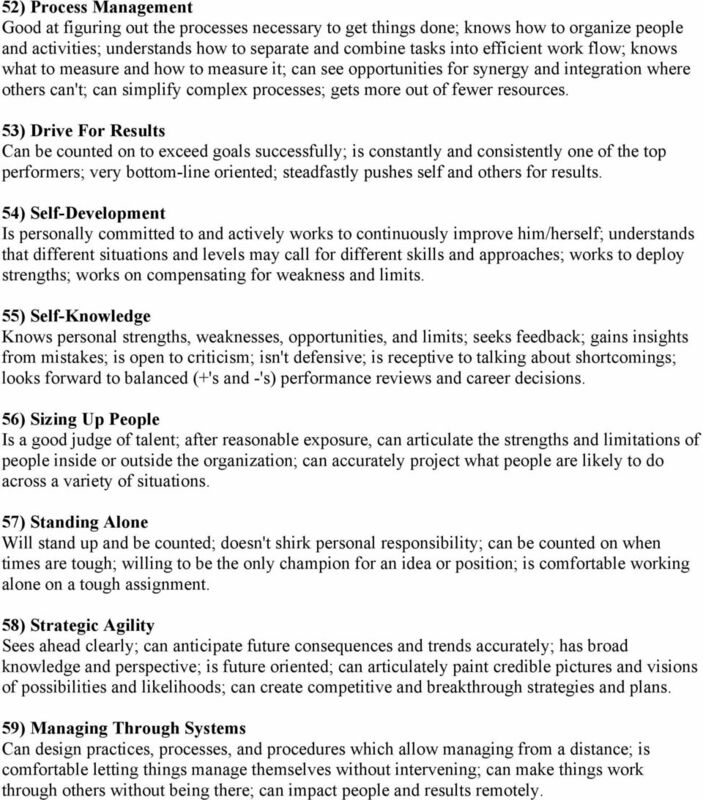 55) Self-Knowledge Knows personal strengths, weaknesses, opportunities, and limits; seeks feedback; gains insights from mistakes; is open to criticism; isn't defensive; is receptive to talking about shortcomings; looks forward to balanced (+'s and -'s) performance reviews and career decisions. 56) Sizing Up People Is a good judge of talent; after reasonable exposure, can articulate the strengths and limitations of people inside or outside the organization; can accurately project what people are likely to do across a variety of situations. 57) Standing Alone Will stand up and be counted; doesn't shirk personal responsibility; can be counted on when times are tough; willing to be the only champion for an idea or position; is comfortable working alone on a tough assignment. 58) Strategic Agility Sees ahead clearly; can anticipate future consequences and trends accurately; has broad knowledge and perspective; is future oriented; can articulately paint credible pictures and visions of possibilities and likelihoods; can create competitive and breakthrough strategies and plans. 59) Managing Through Systems Can design practices, processes, and procedures which allow managing from a distance; is comfortable letting things manage themselves without intervening; can make things work through others without being there; can impact people and results remotely. 8 60) Building Effective Teams Blends people into teams when needed; creates strong morale and spirit in his/her team; shares wins and successes; fosters open dialogue; lets people finish and be responsible for their work; defines success in terms of the whole team; creates a feeling of belonging in the team. 61) Technical Learning Picks up on technical things quickly; can learn new skills and knowledge; is good at learning new industry, company, product, or technical knowledge; does well in technical courses and seminars. 62) Time Management Uses his/her time effectively and efficiently; values time; concentrates his/her efforts on the more important priorities; gets more done in less time than others; can attend to a broader range of activities. 63) TQM/Re-Engineering Is dedicated to providing the highest quality products and services which meet the needs and requirements of internal and external customers; is committed to continuous improvement through empowerment and management by data; is willing to re-engineer processes from scratch; is open to suggestions and experimentation; creates a learning environment leading to the most efficient and effective work processes. 64) Understanding Others Understands why groups do what they do; picks up the sense of the group in terms of positions, intentions, and needs; what they value and how to motivate them; can predict what groups will do across different situations. 65) Managing Vision and Purpose Communicates a compelling and inspired vision or sense of core purpose; talks beyond today; talks about possibilities; is optimistic; creates mileposts and symbols to rally support behind the vision; makes the vision shareable by everyone; can inspire and motivate entire units or organizations. 66) Work/Life Balance Maintains a conscious balance between work and personal life so that one doesn't dominate the other; is not one-dimensional; knows how to attend to both; gets what he/she wants from both. 67) Written Communications Is able to write clearly and succinctly in a variety of communication settings and styles; can get messages across that have the desired effect. Principles Vision Purpose Statement Technical Applications Consultant (version 20 Dec 2011) healthalliance Purpose, Vision and Principles healthalliance provides shared services to benefit NZ health organisations. Beyond Competency-Based Structured Interviewing: How adding Factors, Clusters, and Stallers and Stoppers leads to better interviewing results By George S. Hallenbeck Jr., Ph.D., co-author with Robert W.
1 Board Leader Succession Planning Toolkit The list of steps of the Board Leader Succession Planning Process on this page is adapted from materials developed by the Society for Human Resource Management. Developing a Learning Plan. A Learning Plan can serve as a useful tool for planning and managing professional development.